A Privacy Impact Assessment is Easy – When You Start With a Good Plan! Do you need a PIA? or a PIA amendment? Snooping is a privacy breach! When an authorized person accesses patient records for an unauthorized purpose, this is often considered snooping. Can You Text With Your Patients? Would You Like to Improve the Care Experience for Your Patients? If you are a practice manager, clinic manager, healthcare provider and owner of a private healthcare practice, you need to attend this webinar! In this FREE 30-minute Practice Management Nugget Webinar with Dustin Rivers you will get a behind-the-scenes peak at the upcoming 2016 Saskatchewan Connections conference. In this FREE webinar with Jean L. Eaton, Information Managers Ltd, explains How to Manage Your Patients’ Health Records When You Close Your Healthcare Practice…and YOU are invited! In this FREE 30-minute Practice Management Nugget Webinar with Professional Meeting Facilitator Gord Sheppard that explains 10 Ways You Can Create Awesome Meetings… and YOU are invited! View the blog post and register to view the video. A PIA should be as common place to a healthcare practice as a business plan is to a business. 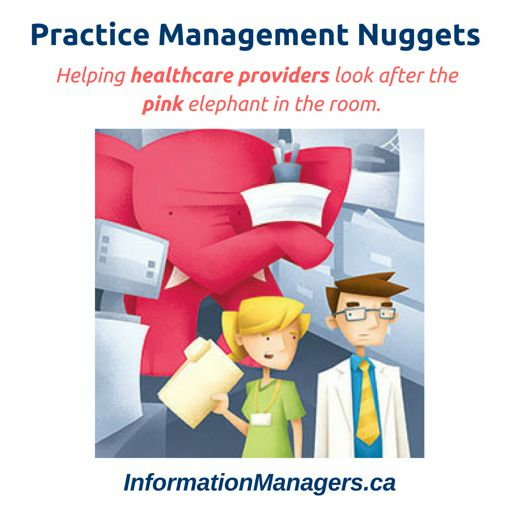 Tips every clinic manager or healthcare provider needs to know. Your clinic manager just resigned. Are you ready to hire? Learn how! In this episode, we spoke with Karanne Lambton, Life Fulfilled Coaching and Amazon Best Selling Author of “Step Up: 52 Actions for Emerging Leaders”. What's the Worst Thing that Could Happen in your Business? HIM Professionals - What is their Role?